Mold is what creates those dirty roof stains to appear; once your roof has mold spores planted on it, you can virtually watch the mold spread. This home-damaging process typically starts with a few black streaks, often under the limbs of a tree, and then over a short period of time the mold spreads across your entire roof. 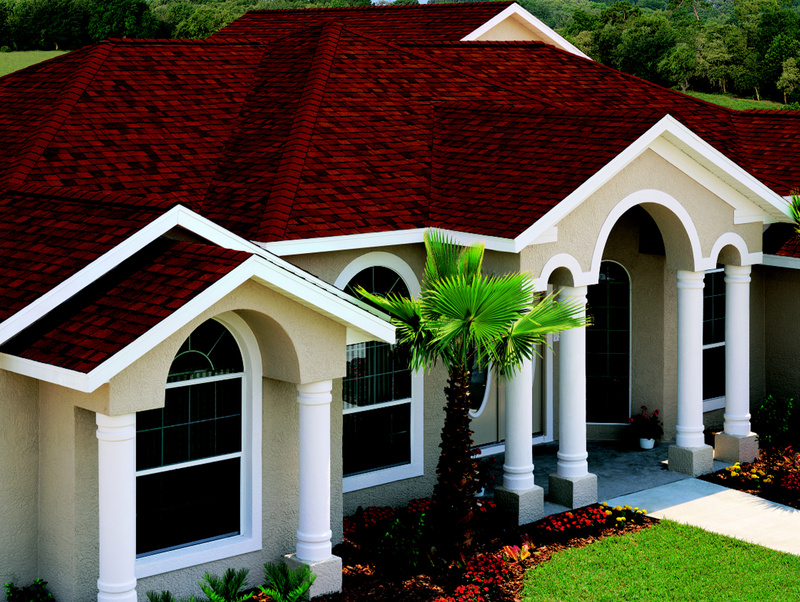 This mold damages your roof shingles by pulling up the reflecting stones, thus reducing your roof life; if you have a tile roof, the mold eats away the glaze finish of the tiles. Leaving mold on your roof will significantly reduce it’s life, increase your home cooling costs, increase your chances of tracking mold into your home, and if you have a pool the mold contaminates it with each rain drop splashing off your roof into it. Pressure washing has been done on some roofs by others, but that annual method of cleaning only shaves off the visible surface of the mold, leaving it’s roots. Even worse, the high pressure spray dislodges many of the reflective granular stones on the shingles, which results in the roof’s loss of effectiveness in reflecting heat; if your roof has tiles, pressure washing removes the factory glaze off of them, leaving a look of pitted clay. In contrast, our soft-cleaning method uses a non-pressure gentle rinse that removes not just the visible stains but also the mold’s damaging roots. Our special chemical mixture achieves results that last for five years, and often longer. And we always take great care to protect your ground foliage, decorations, and any equipment such as air conditioning units and pool pumps. At Home Roof Cleaning we take great pride in cleaning your roof with the utmost care, adding beauty and value to your home. Here are a few items to keep in mind during and after our cleaning procedure. We ask that you follow these instructions to ensure that your home’s roof cleaning is done without any foreseeable problems. a. We ask for anyone at the home during the time of cleaning to remain indoors or to leave altogether before we start; this is to prevent them from coming into contact with drips from the roof or any chemical over spray, which can possibly stain clothes and/or cause a stinging sensation on bare skin. Children must remain indoors during the cleaning. If you must step outside, please give us notice and be very careful of the drip line from the roof. b. To protect your outdoor air conditioning equipment we will be covering it with a tarp, which means at the equipment we will be turning off the power; if it is expected to be a hot day, we suggest that prior to our arrival you lower the setting on your thermostat in anticipation of your air conditioning being turned off. c. Keep all pets indoors during the cleaning process so that they don’t feel any stinging sensations and/or track any chemicals inside the home; they can go out after the cleaning but if they are small enough to pick up and carry, please do so. If they have to walk on driveway, sidewalk or other areas that have been cleaned, just rinse off their paws with water when they go back inside. d. If you are staying home during the cleaning process, please leave your car inside the garage with the door down. If you must leave during the cleaning process, please do not walk outside nor drive your car out of the garage without giving us notice; and when you return, please park your car on the street as far away as possible so as to not track any chemical into your garage from your car tires nor get any over spray or accidental splashing on your car’s finish. When you return, please allow us to give you an all clear signal before approaching the home. e. If after the cleaning you walk on the cleaned surfaces, make sure to take off your shoes and rinse them prior to going into the home. If you had your driveway cleaned, please do not allow any vehicle onto your driveway for at least 4 hours after the cleaning is finished. f. If there is rain in the immediate forecast or it is raining after we finish the cleaning you will need to keep any vehicle not already in your garage outside of the garage and on the street for at least a day. The dirt along with chemicals will be rinsed off the roof during the rain and you don’t want your car coming into contact with the drips coming off the roof. The rain will also provide a rinse for the driveway, sidewalk, patio and decking areas. If the rain is light then you definitely should step outside after the rain and rinse off your plants. Should conduct a thorough inspection of the roof before making any judgment on causes, solutions or budget. To have more discretion, consider performing this inspection, from the inside too, is, coming through the ceiling, taking the necessary care (where to step, flashlight, etc..). • Pasta or leaking cover strip (with and without oil). • Container or long hose. 1) The ideal is to locate the leak on a rainy day, but if you can not try to mimic the conditions of a rain pouring enough water through which the client has detected the leak. 2) Then proceed to look good from the underside of the roof directing the flashlight towards it. If the hole that caused the leak is in that place we can see raindrops shine with light and enough to move on and go back to the same source. There will have to be careful when we believe we have located the source of the leak, because a leaky exhaust on a site can be caused several meters above. 3) Once or located the leaks, climb to the roof, will dry as much as possible the area to be treated. 4) If we use top-leaks paste, the paste will spread generously leak evenly, taking care to leave no peaks or excess grout, and unless we do this over time this will become a point of oxidation as create water retention. 5) If we use top-ribbon also leaks generously cut off a portion of the tape, but before sticking it on the leak try to round the ends of the tape so that any material sliding down the roof does not get stuck in the tip of the tape and we’ve hit a point of oxidation. 6) Try to make repairs in one day being clear or not calculate this by falling rain, for sticking ribbon pasta and more efficiently. • Make sure you have cleaned all traces of adhesive cap-leaks, after giving a reasonable time (according to specifications of the adhesive), check for leaks.